Lavoie, Jennifer. “Tristant and Elijah”, Bold Strokes Books, 2014. Tristant Whitfield has a crush on Elijah Cambridge (who is straight) and he has had it since he began high school. Tristant watches himself carefully and keeps a distance but then Elijah starts to visit him at work and brings him coffee. This only makes him wonder if there is something he might have missed. Elijah finds an old letter that Tristant’s Great-Uncle Glenn had written and hidden in a book. 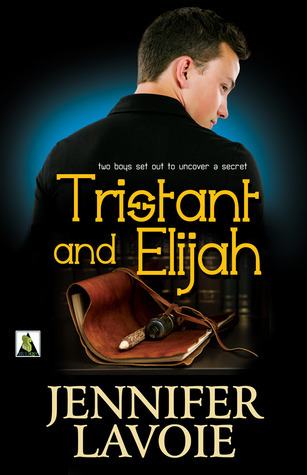 Now Tristant and Elijah are on a journey to find out about Uncle Glenn and the secrets he had. They only have his journals and letters to use but they are determined. Elijah realizes that Tristant is like his uncle in that he is hiding something too. This adventure brings the two boys together. The best word that I can use to describe the story is sweet because the boys learn something about themselves as they search for information about Uncle Glenn. Tristant is openly gay, something we do not usually have in young adult fiction. He is out and he is comfortable with himself even though he wants someone he does not think he can have. He also has to deal with being one of the only out gay students at his school as well as the fact that he has not yet found love. Nonetheless, he is a well-adjusted young man who has a wonderful relationship with his single mother and grandmother. He dreams of a life beyond the small town where he lives but he is by-and-large quite happy. Elijah exudes confidence but he is not sure of just who he is and he also has his struggles. I must admit that I had the feeling that something horrible was going to happen but it didn’t and the story stays light and beautifully written. I found the story to be relevant and one we can all relate to. Many of us have had the experience of having a crush on someone we cannot have. I figured early on that Elijah was closeted or was gay but just did not realize it. So we have the story of Tristant and Elijah and the story of Glenn and his classmate, Jesse and while the stories seem similar, author Lavoie beautifully shows us the differences between the two threads. Of course, time had a great deal to do with everything and when we learn that Uncle Glenn’s story happened in 1909, we understand that being gay was something that was not only not accepted but heavily looked down upon and in some places it was criminal. I thought that this was one of the beauties of the book in that it made us realize just how far the LGBT community has come. I really liked that Tristant was so understanding and supportive of Elijah. Elijah finds his courage to come out of the closet, with the help of the story of Tristant’s Uncle. Glenn’s story was a heart breaker and when we read about someone that lived at a time that was so difficult to be oneself in, we can only thank everyone who made today so free and open. Our gay teens really face no problems aside from internalized fear and anxiety and Elijah has an easy coming-out process (but he did have Tristant for support). Using two different storylines is very effective in showing the changes in society and it really works here. The book is delightful and well written, the story is plausible and the read is fun. This entry was posted in GLBT fiction on July 14, 2014 by Amos.